All entities are defined by [X,Y,Z] “edit” points. These points are usually marked with a ‘+’. These are polyline entities. You change their shapes by moving (dragging) the edit (+) points. Edit points are always turned on (unless they are hidden or turned off). You do not have to select an entity before you move edit points. If you want to set an edit point to an exact [X,Y,Z] location, move the cursor to any edit point and click on the right mouse button. A dialog box, like the following, will be shown. 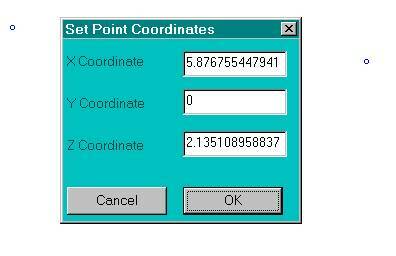 The dialog box shows you the current position of the picked point. If you pick cancel, the position will not change. If you enter new value(s), picking “OK” will change the position of the edit point.